Air pollution is emerging as one of the biggest health hazards facing humanity. 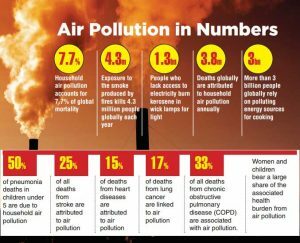 According to World Health Organisation (WHO), air pollution causes health complications like strokes, heart diseases, lung cancer, and chronic pulmonary disease (COPD). Household air pollution is regarded as the world’s leading environmental health risk. WHO says exposure to the smoke produced by fires kills 4.3 million people each year around the world. Over three billion people use polluting fuels and devices – such as wood, coal and dung in simple stoves – for their daily cooking. The resulting household air pollution is the world’s single greatest environmental health risk. According to WHO, household air pollution accounts for 7.7 percent of global mortality. Nearly all of these deaths are in low- and middle-income countries (LMICs), where household air pollution is a leading cause of deaths from non-communicable diseases. WHO says about 3.8 million people a year die prematurely from illness attributable to the household air pollution caused by the inefficient use of solid fuels and kerosene for cooking. Among these 3.8 million deaths: 27 percent are due to pneumonia, 18 percent from stroke, 27 from ischaemic heart disease, 20 percent from chronic obstructive pulmonary disease (COPD) and 8 percent from lung cancer. Exposure to household air pollution almost doubles the risk for childhood pneumonia and is responsible for 45 percent of all pneumonia deaths in children less than 5 years old. Household air pollution is also risk for acute lower respiratory infections (pneumonia) in adults, and contributes to 28 percent of all adult deaths to pneumonia. WHO reveals that one in four or 25 percent of premature deaths from chronic obstructive pulmonary disease (COPD) in adults in low- and middle-income countries are due to exposure to household air pollution.